Procrastination can cause extra stress, missed deadlines, and unnecessary overtime just to name the obvious consequences. Fortunately, you can use proven behavioral changes to get yourself out of the habit and start getting things done. Here are five anti-procrastination tips 6 Tips Prevent Internet Procrastination 6 Tips Prevent Internet Procrastination I am a master of procrastination. Perhaps you are too. There are millions of people who suffer from crippling procrastination and it’s a real drain on productivity and efficiency. The weird thing is, many of... Read More you can follow and 10 apps you can use to really put them into action. If you get too overwhelmed by a task, the resultant fear could make you unintentionally idle. Stopping that from happening is all about your mindset. Coach yourself to believe you can get stuff done, even if it doesn’t feel like it. What’s Up? is a mental health evaluation tool. It could help you get to the bottom of what’s making you overwhelmed. Are you feeling swamped because of a past bad experience or the hurtful words someone said? Made for iOS and Android, What’s Up? works off of well-known psychological principles 6 Mind-Blowing TED Talks About Psychology & Human Behavior 6 Mind-Blowing TED Talks About Psychology & Human Behavior The human brain is complex and confusing, which explains why human behavior is so complex and confusing. People have a tendency to act one way when they feel something completely different. Here are a few... Read More — specifically those derived from Cognitive Behavioral Therapy (CBT) and Acceptance Commitment Therapy (ACT). Learn to recognize negative thought patterns and break free from them. Plus, use the catastrophe scale to regain perspective when a task seems too hard to finish. Ever hear someone say you need an attitude adjustment? If so, you’re not alone. Having a grumpy or otherwise negative outlook This Depression & Anxiety Test Will Help You Understand Your Emotions This Depression & Anxiety Test Will Help You Understand Your Emotions Too many people are in denial about depression, anxiety, and stress. Use this self-assessment test to see where you are with each of the three and what you can do about it. Read More about a responsibility can be debilitating. You might eventually convince yourself a task isn’t worth attempting and decide you’d rather face the consequences. If an upbeat internal dialogue isn’t causing the attitude changes you seek, turn to tech helpers. ThinkUp is a very popular iOS app that’s now available for Android. Depend on it to develop a better mindset and reap the associated rewards. Maybe you’re procrastinating about quitting smoking, or perhaps you keep putting off going to bed early enough. The app helps you with those common types of procrastinations and many others. You can even record positive affirmations, or statements, in your own voice to get optimal results. Spend an adequate amount of time in the app daily to improve chances of consistent progress. The Strides Habit Tracker is also a worthwhile investment. It’s best if you’re trying to trade a bad habit for a better one. Doing that is hard enough no matter what, but more so if your mindset convinces you you’ll fail. Made for iOS, this app functions smoothly on your iPad, iPhone, or computer. The goal-setting tips help you create goals you can genuinely reach. Meeting goals should result in a more positive mindset. You can also track progress over time. When you notice you’re steadily going in the right direction, your mood should get a boost. Plus, metrics enable you to make smarter decisions if things aren’t going well, thereby avoiding discouragement. If you typically wake up about the same time without an alarm, you’re responding to circadian rhythms. Primarily responsive to light and darkness, they also affect things like lung capacity and hormone production. Some people also assert that tuning into circadian rhythms could maximize productivity. Could doing that get you out of a procrastination rut? Maybe you’re not even sure how much sleep you should get. Find out by using a web-based app called Sleepyti.me. Discover what time you should wake if you go to bed immediately. Keep a diary based on how you feel when abiding by the app’s suggestions. Eventually, after adjusting your sleep schedule, you should become more aware of your body’s natural cycle. Also, to follow your biorhythms and help science simultaneously, sign up for myCircadian Clock. It’s an app that goes beyond sleep patterns and examines eating and activity trends. You’ll periodically receive survey questions about well-being.Your answers and the other collected data become part of a study happening in California. You must be at least 18 years old to take part. Moreover, meeting eligibility minimums is necessary as a study participant. Your answers and the other collected data become part of a study happening in California. You must be at least 18 years old to take part. Moreover, meeting eligibility minimums is necessary as a study participant. After ten days of data collection, myCircadian Clock starts giving you feedback based on your lifestyle. Reviewing it should simplify using circadian rhythms to your advantage as you avoid procrastination and improve output. Maybe you can’t remember the last time you felt compelled to do something quickly. If so, that reality feeds your procrastination habit. The aptly named Hurry app for Android is a recently released option that’s already earning good reviews. It’s a countdown timer that uses animation in appealing ways. Make an event for an upcoming wedding in Hurry if you’re avoiding shopping for an outfit. The user-friendly interface facilitates creating any kind of milestone imaginable. Periodic notifications ensure you don’t miss impending obligations. Also, if procrastination often leads to public transportation woes, start hoofing it with help from the Transit app. It has a routing feature called Go that alerts you when a driver is ahead of schedule. After receiving that notification, you’ll know there’s no time to drag your feet. The Go functionality is relatively new, so it may not be perfect. However, it could get you on the move and prevent hassles. You can also punch procrastination out of your life by using what experts call a “starting ritual.” As most people know, the first step in a process is often the hardest. A starting ritual could bridge the gap that makes you afraid to start something How to Start Any Project Now When You Don't Feel Like It How to Start Any Project Now When You Don't Feel Like It Do you need help to get started when it's tough to take that first step? Beat procrastination and just start with these five simple strategies. Read More . It makes the unpleasant parts of a task more appealing so you can deal with them. For example, listen to a song you love while getting dressed for the gym. You may realize there are parts of your routine that hinder you from getting things done. Identify them with an Android app called Time Tune. Perhaps your gym-starting ritual is half as long as the total time spent working out. Consider re-evaluating things and making a shorter starting ritual, but don’t do away with it altogether. Time Tune also gives push notifications. Rely on those to get cues about when to begin a certain starting ritual. Too distracted to even think about making a starting ritual? A Mac-based app called Self Control should help you stay focused — at least as long as your distractions are internet based. The app blocks access to anything online you specify. It continues working for the desired time, even if you restart your computer or delete the app. What Will You Stop Putting Off? 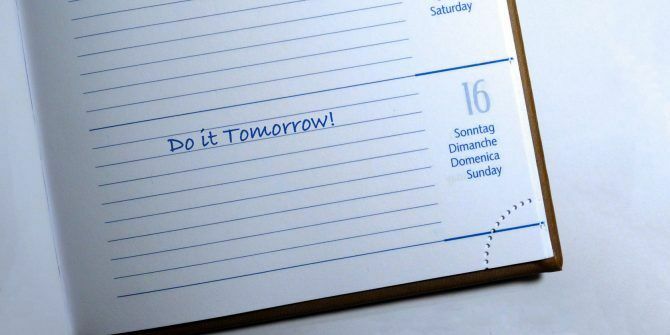 Even for chronic procrastinators, this habit isn’t impossible to beat. Start thinking about your to-do list differently using these tips and apps. What have you been putting off for a while 11 Quick Fixes for the Bad Habits That Kill Your Mental Energy 11 Quick Fixes for the Bad Habits That Kill Your Mental Energy There are millions of things that drain your mental energy. You can develop good habits to increase your mental energy reserves. The tips here are a great place to start. Read More ? Knock it out today!